Composer Ben Yarmolinsky is a professor of music at the Bronx Community College of the City University of New York and a founding member and director of Friends and Enemies of New Music, an organization that has been presenting concerts of contemporary music in New York since 1989. Recently he released the CD, Paradise: Songs on Poems of Samuel Menashe, and he explains how he came to set Samuel’s poetry to music. I knew Samuel Menashe for the last seven years of his life. We were introduced in the spring of 2004, at the cocktail party following the annual awards ceremony of the American Academy of Arts & Letters. Samuel did not receive an award from the Academy on that day—nor on any other day. This poem presents a wonderful opportunity for text painting. In my arrangement the left hand “ribbet” motive of the piano is imitated closely by the bass notes of the cello, and echoed by the strings and percussion, so that the listener has the sense of many frogs “responding in perfect accord to one another.” I like to think of my songs as a kind of response to Samuel’s harping. 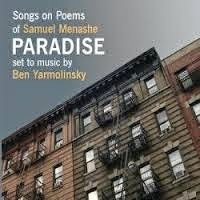 Paradise: Songs on Poems by Samuel Menashe is available as a CD or music download from cdbaby.com, iTunes, Amazon, cdUniverse.com, or directly from the composer, at benyarmolinsky.com. The e-book edition of Samuel Menashe: New and Selected Poems is on sale for the month of April, for as low as $3.82 for Kindle, Kobo, Google Books, Nook, and iBooks (via iTunes). Watch “Samuel: The Concise Poet,” a three-minute episode of WNYC’s Know Your Neighbor featuring Samuel Menashe and his dilapidated West Village walk-up apartment. Lyrics copyright © Literary Classics of the U.S., Inc. Music copyright © Ben Yarmolinsky.